Notes from the Network democracy and technopolitics. Transformations of the electoral space and new prototypes post-15M , organized by the Communication and Civil Society programme of the IN3, X.net and FCForum, in Barcelona, Spain, on November 4th, 2014. More notes on this event: tecnopolitica14. From Acampada Sol to Podemos. Experiments of digital democracy in Podemos. Labodemo adapted Loomio, a collaborative decision-making tool. It enables people that do not like to speak out, to participate in assemblies and other collaborative spaces, while it allows to know what is happening in a group, during a discussion, etc. Another tool that was put up during the 15M: Propongo. But it did not work as it was expected. To solve the lack or participation, they put up a channel on Reddit, a little more chaotic, but more flexible and, thus, more successful. With these tools, the concept that verticality is more effective than horizontality has been quite challenged. One of the problem, though, is that novelties catch more the attention than older threads. To have a less chaotic environment, when a thread is tagged as ‘proposal’, it is taken onto another platform so that they can be discussed more calmly and thoroughly. It is crucial that no space dominates over other spaces. That is why participation is called to transpose what is spoken at a given platform (including face-to-face assemblies) onto other platforms or spaces. So far, openness and flexibility has worked well and there is no trolling or abuse of power. It is unknown whether in the future managing the platforms will become more complex, but so far participation has been smooth and respectful. To try and gather up what was being discussed in the several threads and in order to prepare for the Podemos General Assembly, a “wikisynthesis” was put up (by using a wiki tool). But people participated much much less, maybe due to the different and more complex environment. During the General Assembly, Appgree was used to support a more traditional event based on presentations and questions to the presenters. Appgree helped in sorting the questions and assessing their popularity or relevance. Next challenge: that the proposals that people put up on the web (through Agora Voting, another tool) are selected in a binding voting, so that decisions made afterwards take into account these open processes. What kind of infrastructure do we need for a constituent phase? The identity and democratic infrastructures of today’s digital society must be managed as a common good. The Internet of Things, the industrialization of the Internet,s is the convergence of the communication Internet, the energy Internet, the logistic Internet, transport networks, data-intensive welfare (health, education, housing, work) and the money and payment system. A huge market of data and new information intermediaries as powerful monopolists. Is there still room for democracy? Will there be an app for that? The smart city is the city as a black-box, the logic of financialisation, the ruling of cities as banks. Instead, we need the democratic city, the right to the city and to public spaces. The city should not be a mega-market, a bunch of assets. The city today is what factories used to be for the industrial times. We are giving away all the critical infrastructures of our common spaces, of our cities. Build a federated, open, privacy-aware modular infrastructure for democracy. Politics of data (data ownership, data portability, crypto tools) is key. From the Smart City to the Democratic City. Citizen ownership of data and identity. Security and privacy by design. Federation, open source, open standards. Exploit the network effct through mass user adoption. And most of these are not technological issues, but political ones. Limits and potentials of technopolitical practices from the 15M to #OccupyCentral. New technopolitical experiments in the constituent phase 2013-2015. From September 26th to 29th there’s the outrage of #OccupyHongKong in some similar ways as the Spanish 15M. More than 2,000 tents camp in big avenues. ‘Stand by you‘ enables people from all over the world to participate in the physical space. FireChat is an OpenGarden’s application that creates chat channels supported by a mesh network by using bluetooth, a sort of wifip2p network. Also drones were used to map the demonstration. In the Indignados movement, social networking sites were appropriated by individuals, which can be understood as a multilayer model where each layer is a communication space. And how citizens, media and the power tries to control each layer, which is interconnected with the others. When energy accumulates in many layers, the energy is thrown to the streets and the mainstream layer has to report what is happening and include the topic in the mainstream agenda. This multilayer model has to be understood, too, at the international level. Podemos also can be modelled with a multilayer approach, being their singularity that they especially did well in the mainstream media layer. And beyond the self-organized movement of the 15M, Podemos succeeds in putting up a political mobilization that ends up with a self-organized social mobilization, which feeds back the former, closing a virtuous circle. With Podemos, there is a tension between the distributed leaderships and the strong central leadership of Pablo Iglesias from Podemos. Millions of people have used the Internet worldwide to go out to the streets to demonstrate. Limits of technopolitics: making-decisions, synthesise. Podemos articulates, through Reddit and Appgree, spaces and platforms where to copse the feelings, ideas, etc. of the different participants, a space not only for information but for deliberation. Same with DemocracyOS in the case of Guanyem. Movements pre and post 15M. Territory and communication devices of Podemos. AppGree is an application to communicate and deliberate online. The problem with the broadcasting model is that is does very poorly managing (or understanding) feedback. DemoRank is the PageRank for the backchannel of the Internet: it tries to make sense of what is being said and by whom. It ranks the number and kind of proposals, the size of the group, etc. This ranking is iterated until an agreement or a solution is found. After a proposal is selected, it is made available to the whole group so that the whole group can evaluate it. After all, the result is that sampling the proposals and presenting them to the potential voters, one can achieve highest levels of precision without implying massive voting (massive as in many people and massive as in voting many many times). Thus, it really simplifies the steps to form one’s opinion and, over all, to make simple choices among complex issues. Experience in networked practices in the 15MpaRato and Partido X. The network is a kind of organization that uses the Internet and other ICT tools to leverage its power, but also that learns a lot from the Internet and other similar practices. The core is how to put up democratic production practices while being effective and efficient. The 15M is a factory that builds prototypes, devices to democratize politics. What tools? Is there a fetishism on certain tools? Certainly: there is no tool to solve all organizational problems. There is a toolbox whose tools can be applied here and there, most of the times combined and put to the service of many other efforts. Usually, first comes the community, then the needs and, last, the community: rarely the other way round. And this community is always open: only openness provides the necessary requisites for a community to articulate, for contributions to be enabled. Networked democratic production (vs. industrial democracy) is based on netiquette, on certain protocols that people agree upon and use to articulate their interactions and exchanges. It is important to always have in mind scalability: work for the short term, but thinking ahead. Setting up the protocols, processes, devices that will be used for a specific goal but with the aim to reuse them, to transform the status quo, to break the actual balances and thus disclose new spaces upon which to advance. If information flows naturally, most decision-making processes become unnecessary. Many times, voting is failure: there is someone that will be defeated. Thus, instead of voting it is better to fork the project, to allow for other projects to grow organically. Sergio Salgado: what is the role of #OccupyCentral? Javier Toret: after October 15th, the camp that last longer was #OccupyCentral’s, but it quickly fade. Later, the name was recovered but its nature was actually very different. Sergio Salgado: do people that participate in Appgree then do not participate in other platforms? Antonio Ruiz: as a backchannel, it does not compete with other communication channels, but as a complement: it is a channel that does not broadcast information, but collects the feedback and serves it to the users. Q: did Partido X tried to control all breaches while Podemos went more like a beta-test way? Javier Toret: there is a tension between two kinds of hegemonies, one more decentralized, another one more centralized, but the productivity will come when this tension becomes a productive tension, a new way of doing things that takes the best of both worlds. Pablo Aragón: what about opening up the code and the algorithm in Appgree? Antonio Ruiz: there is a commitment to do it if the collaboration with Podemos goes on. 15M-25M: Openness of the institutions or taking the power? Víctor Sampedro (Universidad Rey Juan Carlos). Technopolitical users and the 15M as an indignado consensus. On 13th March 2004 (the Atocha terrorist attacks in Madrid) the political elite lies and loses all legitimacy for representing the citizen. And the citizens take up the organization of the protests and become new crucial actors in politics. The answer to the economic crisis that merges the regime of 1978 and that of May 2011. A change in consensus or a consensual dissent of the 15M. Polarization of the public sphere. A dire crisis and conditions of living. Lack of answer of the political representatives. Urgent need to re-stablish debate and deliberation. Political elites not only “do not understand” new politics, but try to corrupt any emergence of new ways of political participation and engagement. The worst kind of slacktivism is promoted among the partisans of traditional parties to play havoc in any kind of cyberactivism. Despite the power of television, a new digital sphere emerges where people get information and get involved in politics, in opposition to the traditional way of being informed about politics through mainstream media. Q: is the voter of the Partido X the same as Podemos’s? Ismael Peña-López: probably not, they play in different but overlapping spheres. Podemos emerges from the communist party while the Partido X (or the Pirate Party) has a very different nature. Notwithstanding, the political geeks of the Partido X power Podemos, collaborate with them and are even part of their circles. Political evolution from the 15M (2011) to the 25M (2014). A political science approach. Traditional politics is not prepared for this upcoming change. There is no space for public affairs outside of the State. The approach is that of the homo economicus: politics as a market. Democracy is based on rules, not values: elections based on competitiveness, the winner takes it all, etc. Legitimacy is a mix of ideology and being functional in delivering services and welfare to the citizens. And political science has a Fordist approach to this phenomenon, mainly based in an economicist approach or point of view. On democracy: from the 15M to the 25M the frame upon which democracy is based has been broken. As this is the frame put into practice by the main political actors at the international levels, these actors have suffered a legitimacy shock. There is an attack to rules from the field of values. A second major change is the confluence of new actors in the political arena. Constitutions had set who could participate in politics (i.e. institutions) and now new actors are vindicating taking part in politics. And taking part in politics from outside of institutions, which is, again, a dire change: there used to be no politics outside institutions, and now citizens are claiming public affairs as something which is theirs, and not the institutions’. Participation is understood as doing, as acting. If institutions cannot deliver, citizens will organize, self-organize, and just do it. People won’t accept intermediation in politics, boosted by a powerful technological aspect. There is the perception that the powers do not represent people because (1) they are not defending the interests of people, (2) because the political elites do not actually live like the people that they are supposed to represent and (3) because, all in all, the are actually taking no decisions. This is a triple breaking of the contract signed between representatives and citizens. When institutions, the ones that are present in them, do not represent the ones that are absent, something is wrong. Especially when those who are absent, thanks to technology, could actually be present. The 15M makes it possible that the “nobodies” can take a leading role in politics, that they are relevant actors in the political arena, in the process of decision-making on public affairs. And this participation can take multiple shapes and be reshaped: we can change our identities, our networks, depending on our often changing interests. From collective action to connective action. The 15M is not a movement, but a process of social connectivism (vs. the social constructivism that used to be). Processes are as important and results (or even more). And this is a new paradigm that separates the ones that do politics with the Internet and the ones that do politics on the Internet. Indeed, accepting the logic of the Internet means denying the logic of the party. Political evolution of the 15M: the creation of 15MpaRato and the Partido X as examples. XXIst century democracy and myths about digital participation. The 15M is completely alive and the first effects are already taking place, e.g. the end of bipartidism (the hegemony of the Socialist Party and the Popular Party). The 15M is both a destitution and a constitution process, due to dis-intermediation of organization, information, etc. One can reach autonomy by practicing it, and this is what the 15M is doing: practicing new ways of political commitment and participation. The Partido X places itself in the future and tries to bring to the present the view of what could be — and maybe should — and proposes a destituent process where institutions are emptied of content, and be filled with the civil society and their aspirations. It tries to make compatible a horizontal approach to participation and the need for a vertical structure that can challenge the established powers. The frontal attack to corruption in Spain has become the flagship of the destituent part of Partido X: getting rid of old structures by getting rid of old practices (and old practitioners). While the constituent part is Democracy Period. The Partido X believes that forking is not dividing strengths, but multiplying the fronts from which to attack a common enemy. Democracy is not agreeing on everything, but being able to live one with the other in disagreement. This does not mean that we do not need professionals in politics: we do need them, we do want professionals in politics. The issue is not that they are “normal” people (i.e. not professionals, people like you and I) but how to control them, how to make their decisions transparent and accountable. Transparency is not about telling absolutely everything, but opening up the “code”, the possibility to track decisions, to replicate them, to evaluate each and every step. Q: how these political revolutions relate with the commons? Joan Subirats: there are three different fields (1) environmental sustainability, (2) the collaborative economy and (3) the digital commons. The first one has been deeply analyzed by Elinor Ostrom; the second one is about to be discovered, but there are already very good initiatives about it. Concerning the digital commons, while Jeremy Riffkin’s idea of marginal cost zero can be discussed, it is a good approach. An even better approach is Harvey’s approach to scalability. All in all, the central idea is that we should not surrender everything that is public to what is institutional, the state-centrism. Pablo Aragón: how to build things economically? is all about crowdfunding? Simona Levi: it is not as much about raising money, but about being responsible of one’s actions, about leading them, about making real feasible proposals. Javier Toret: taking the power or distributing the power? Joan Subirats: the key is representation by action, entering politics by doing things, by delivering, by actually representing the citizen. Q: what happened with the Partido X? Simona Levi: the Partido X is in the future and speaks from there . The Partido X has leapfrogged a phase, the institutional one, which is the one that other new parties like Podemos or Guanyem are now following, channelling new messages to set up the destituent phase. 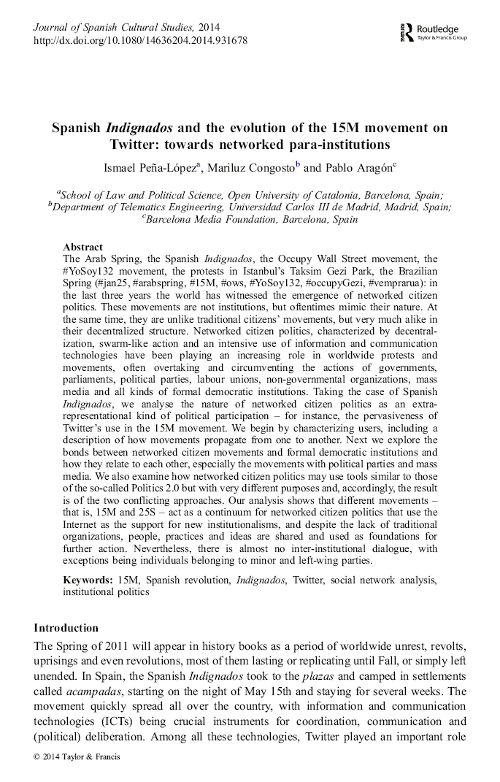 My research on slacktivism has finally been published as a paper both in Spanish and Catalan at two “brother” journals: Educación Social. Revista de Intervención Socioeducativa and Educació Social. Revista d’Intervenció Sòcioeducativa . This is work that I had already presented at two conferences — 9th International Conference on Internet, Law & Politics; II Jornadas españolas de ciberpolítica — and, thus, is now available in three languages: the former two plus English. What follows — after the abstract — is a list of the references and full text downloads for the papers. The main idea of the papers is that if we look at slacktivism from the point of view of the “activist”, it is but true that it is a very low-commitment activism. But if we take the approach of the politician or the policy-maker, or if we take some distance and take a look at the whole landscape, what we find is that slacktivism is only a tiny portion of a huge cosmos of people very actively engaging in politics, extra-representational politics though, and that is why most of it flies underneath the traditional political radar. Politics have traditionally looked at the exercise of democracy with at least two implicit assumptions: (1) institutions are the normal channel of politics and (2) voting is the normal channel for politics to make decisions. Of course, reality is much more complex than that, but, on the one hand, all the extensions of that model beyond or around voting –issues related to access to public information, to deliberation and argumentation, to negotiation and opinion shaping, or related to accountability are based on institutions as the core axis around which politics spin. On the other hand, the existence and analysis of extra-institutional political participation –awareness raising, lobbying, citizen movements, protests and demonstrations– have also most of the times been put in relationship with affecting the final outcomes of institutional participation and decision-making, especially in affecting voting. Inspired in the concept of «feet voting» (developed by Tiebout, Friedman and others) in this paper we want to challenge this way of understanding politics as a proactive and conscious action, and propose instead a reactive and unconscious way of doing politics, based on small, casual contributions and its posterior analysis by means of big data, emergence analysis and pattern recognition. In our theoretical approach –illustrated with real examples in and out of the field of politics– we will argue that social media practices like tweeting, liking and sharing on Facebook or Google+, blogging, commenting on social networking sites, tagging, hashtagging and geotagging are not what has been pejoratively labelled as «slacktivism» (a comfortable, low commitment and feel-good way of activism) but «casual politics», that is, the same kind of politics that happen informally in the offline world. The difference being that, for the first time, policy- and decision-makers can leverage and turn into real politics. If they are able to listen. If they are able to think about politics out of institutions and in real-time. Peña-López, I. (2013). Casual politics: del clicktivismo a los movimientos emergentes y el reconocimiento de patrones . En Educación Social. Revista de Intervención Socioeducativa, (55), 33-51. Barcelona: Universitat Ramon Llull. Peña-López, I. (2013). 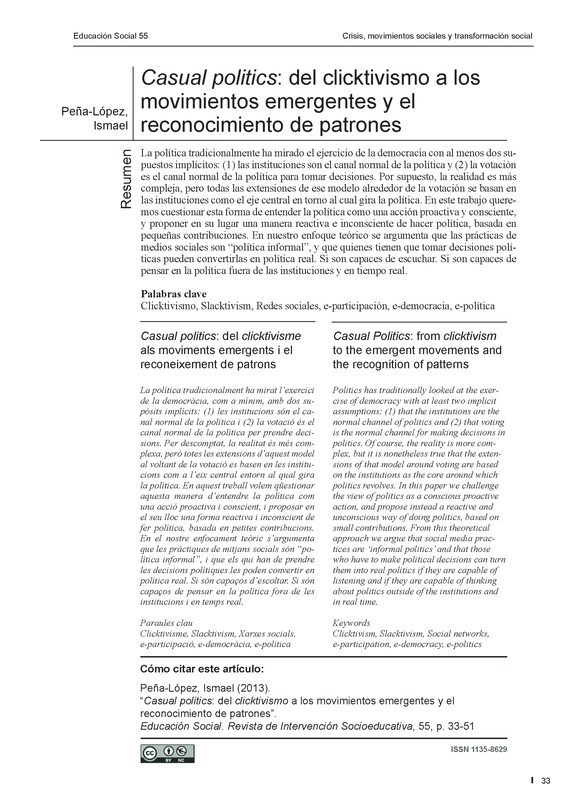 Casual politics: del clicktivisme als moviments emergents i el reconeixement de patrons . A Educació Social. Revista d’Intervenció Sòcioeducativa, (55), 33-50. Barcelona: Universitat Ramon Llull. Peña-López, I. (2013). Casual Politics: From slacktivism to emergent movements and pattern recognition. Proceedings of the 9th International Conference on Internet, Law & Politics. Universitat Oberta de Catalunya, Barcelona, 25-26 June, 2013. Barcelona: UOC.